Goldberg wins WWE Universal Championship. What Next? He is known for his thunderous Spears and for his devastating Jackhammers. He is known for his dominating in-ring presence in the WWE. He is Bill Goldberg. However, it is safe to say that Goldberg was intimidating and much more during the 1990s when he was part of World Championship Wrestling (WCW) and later in the World Wrestling Entertainment (WWE) during 2003 to 2004. After a hiatus of nearly 12 years, Goldberg returned to the WWE in 2016. He continued his rivalry against Brock Lesnar, whom he beat at WrestleMania 20 in March 2004. Although Goldberg looks a bit old, mainly because of his white mustache and beard and his not-so-fit physical appearance, he is, in fact, a part-time WWE superstar who has been sent to fame in the WWE. Following his win over Lesnar at the 2016 Survivor Series in November 2016, Goldberg’s future in the WWE looked dreary. However, Goldberg faced the then WWE Universal Champion, Kevin Owens, for the title match at the Fastlane 2017 on March 5, 2017. Goldberg, after Kevin’s attention was distracted by Chris Jericho, delivered him a Spear and a Jackhammer to win the match and become the new WWE Universal Champion. 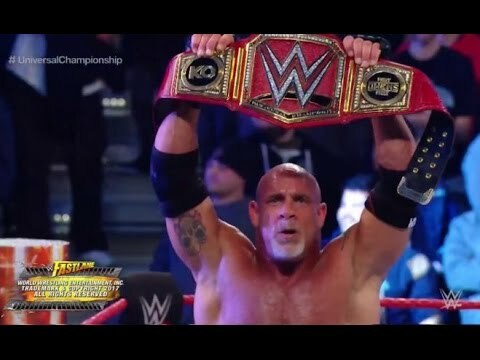 This moment, although a historic one for Goldberg and the WWE, would have been a sight of repugnance especially for those full-time WWE Superstars who deliver their best every week on RAW. Perhaps the WWE wanted to give Goldberg one last Championship run before retiring. However, his match at WrestleMania 33 is against Brock Lesnar and it will be for the WWE Universal Championship. Stakes are pretty much high for this match however, with Goldberg winning his recent matched against Lesnar and Owens within two minutes may create a predictable nature to his match at WrestleMania 33. I hope these two Superstars do give the WWE Universe what it deserves, a good match with slams and powerful moves. I also believe that the WWE would add credibility and power to the WWE Universal Championship by making Goldberg wear it around his waist for some time. Who knows which part-time Superstar emerges from the oblivion to win this title. I certainly hope Lesnar does not remain a WWE Universal Champion for long and that the WWE must give one of the regular full-time WWE RAW Superstars to become the WWE Universal Champion. Until Goldberg is Champion, let us see what does he do NEXT!